Both are paid ways to promote your series. Both are ran by Google. The former I found extremely useful while the latter, not so much. It's like your video is appearing at top of search results. Depending on your keywords, you can get away with paying only 1 cent per view. And the great thing about it is you're getting people who voluntarily click your video and have a sincere interest to watch your video. Also, you can set daily budget limits. So you don't have to worry about signing up, suddenly getting 100 million views and then owing YouTube $1 million dollars. lol. My daily budget = $1. They will display your ad next to Google search results and other Google services (like Gmail). The visitor gets sent to a website address of your choice which is cool as you can create your ideal landing page. However, the ads are text-based and not video thumbnails like YouTube Promoted Videos. So I tried this, and it like... doesn't work. lol. The "easy" fix is just to increase your bid, but check out those estimates: $1.00, $2.00! I'm not paying that much money for each single view when I could eat at McDonald's instead. But then I clicked the sub-topics, and my brain exploded. So much material to absorb; when am I going to have the time to do all that stuff ? Yet, I have time to complain about it all in this blog, lol. 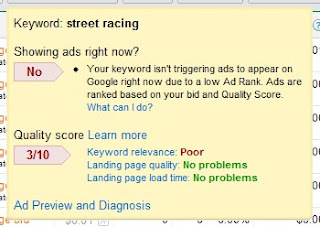 Keyword relevance is "Poor" for "street racing" although my show is about "street racing". The name of my show is "Adrenaline - Street Racing". 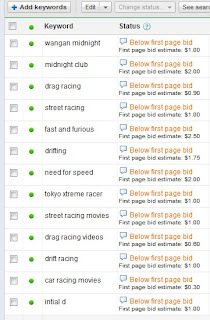 I'm sure Google wants me to optimize my site somehow so that their algorithm can figure out my series is truly about "street racing" but... that takes time. Additionally, I tried Googling some of my keywords and NO ONE'S ADS are showing! I don't understand why I have to bid $1.00-$2.00 to show my ad when nothing is there. YouTube Promoted Videos is a totally cheap, easy, and fast way to promote your series. Google AdWords costs money and\or time and is probably better suited for people selling stuff. 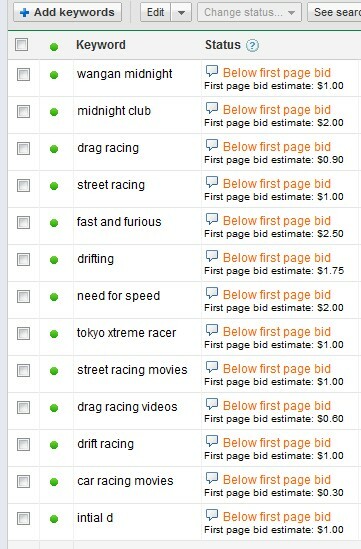 Some time in the future, I will try out Bing, Yahoo, and Facebook advertising and see if that works any better for me. What the heck? A Blog! ?